I Forgot My Password - Can I Somehow Get My Auto-login-Remembered Password? - Ask Leo! I Forgot My Password – Can I Somehow Get My Auto-login-Remembered Password? 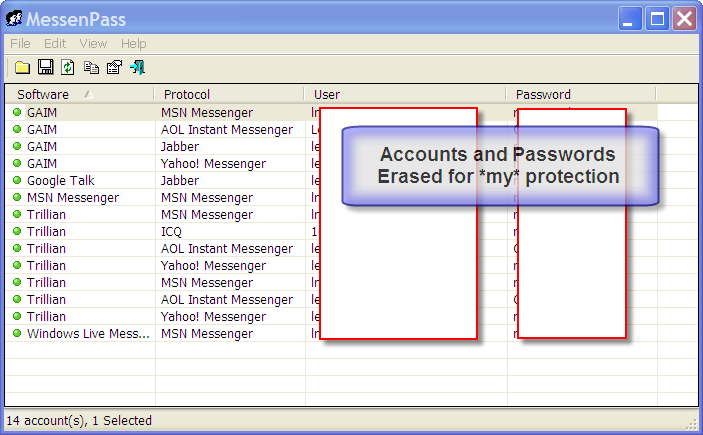 There are tools to recover most of your 'remembered' passwords. You can use them if you forgot your 'remembered' password -- and so can anyone with access to your machine. Yes. And that should scare you, because it’s an important lesson about just how dangerous it is to use ‘remember me’. Why? Because if you can recover it, then anyone who has access to the machine can probably recover it. ‘Remember my password’ doesn’t seem like such a good idea anymore, now does it? You can see that it lists, for each IM program I run, the service, the account name and the password. While I’ve obfuscated them here in this example for my protection, the account names and passwords are displayed in clear text. I’m not guaranteeing it, of course, since there could be many other things at play, but if you’ve lost a password, and you have ‘Remember’ turned on, there’s a very high likelihood that you can grab one of the utilities from NirSoft, and recover it. It’s certainly one of the first things I would try. Yet Another Word About Security I encourage you to download those tools and play with them on your own machine. Using them, you’ll see how trivially easy it is to recover many passwords that are merely hidden by the ‘remember’ function of so some applications. Now remember: anyone can use them. If you leave your machine logged in, anyone who can walk up to it can insert a USB stick with these tools, and get your saved passwords just as trivially. And while logging out or using a password protected screen saver puts up a barrier, even that barrier, while significant, is not impenetrable. I want to make sure you remember two important things: 1) ‘Remember my password’ is a convenience, and a security risk. Use it with caution. 2) If your machine is not physically secure it is not secure. If someone can walk up to it, insert a disk and reboot it, they can take total control. And that includes recovering your passwords with tools as we’ve seen here. And remember also, that while you’ve just read this article and learned how to recover your remembered password … your ‘friends’ and perhaps those who are not your friends have also read this and learned how to steal your remembered password. How Do I Change My Hotmail or Outlook.com Password If I Forgot It? - Forgot your Hotmail password? Your Outlook.com password? There are a couple of ways to regain access to your account. Using recovery information you set up originally, or information you can remember about the account, I'll show you how to go about getting your account back. Did Someone Log In to Google with My Password? - It's frightening, on the server side, to watch the constant attempts being made to slowly brute force a way into email accounts. So it's safe to assume that if Google notified you - someone got in! A much safer approach would be to use a password manager like Lastpass to remember you passwords for you. It uses industrial strength encryption to protect your passwords, and protects against somebody sitting down at your computer and seeing your passwords. I’m actually evaluating Roboform right now. Roboform will display Internet Explorer cached passwords (only, apparently). That’s yet another security risk, as anyone who can walk up to your machine can install RoboForm and then see those passwords. It’s unclear how/if Roboform handles messenger and other passwords that exist at the time it’s installed. Once you install it, it WILL display passwords that it maintains for you. i understand that by using some software such as MessenPass you can see your password in text if someone uses “remember my password”. however, is it possible to recover previous password…the one that you had before your current password. is there a way? If the article above didn’t help, the you’re out of luck. If you forget your password and you used a bogus email address, there’s no way to recover. ALWAYS USE A REAL EMAIL ADDRESS THAT ONLY YOU HAVE ACCESS TO. Is that not clear? What am I missing? i forgot my myspace password can i get a new 1???? is there a way to view ALL of your passwords used on a single account over time? because i lost my myspace password and tried several others off the top of my memory while i still had the save password button clicked is there a way to view ALL entered passwords? I use Firefox with a master password, but Opera is my favourite browser (except when it doesn’t display certain web sites as the designers intended). I prefer the way Opera handles passwords, except that I’ve found no way to retrieve a site password when, for example, a web site doesn’t display and I want to switch to Firefox. Opera’s good with cookies, by the way, in that I can delete them all on exit, except for a few sites that I’ve made exceptions. I am just putting my two cents in here. I have been a user of RoboForm for a few years. I have a very strong password and I also have a fingerprint reader on my laptop. I rarely forget my passwords but lately have had to change a few due to compliance for complexity for secure websites concerning money. As long as I have 4 of my 10 fingers I can always get into my computer and my passwords. No one else can. But I do recall your blog about an administrator password disc work around. Is my laptop still secure? I do not know anyone who would have that disc but it’s not impossible. Am I correct? Thank you, my Internet Guru. I’m afraid I don’t understand the question. If you’re asking if the admin password can be reset by booting from a CD, yes for BIOS machines, and UEFI machines with secure boot turned off. Leo’s loyal fans would beg to differ. We love his straightforward, easy-to-read style. All I can recommend is to go through the password recovery / I forgot my password steps that Yahoo! provides. Gmail is an email account, and your Facebook can be accessed with a tablet using either a browser of the Facebook app. You just have to set up the app, or access the account via the browser using the email and password combination. TOO MUCH security!! There is no such thing as 100% security. The likelihood of someone even trying to access my stuff is almost non-existent. It just makes things more difficult for me to access my own. The might find out the secret location of my DIRTY UNDERWEAR!! Hi. my facebook account was hacked.. can you recover my facebook account password without code? whenever i try to loggedin the anwser is my mail and password is incorrect,so,i need your assitance.